Dermarolling / Microneedling / Dermarolling + salicylic acid peel! Yes it makes sense to use peels in combination with needling even though it is not required or necessary. Needling goes much deeper than peels, apart from deep phenol peels. I recommend pre-treating the skin with dry brushing, which is basically mechanical exfoliation comparable to very mild peels. Yes you could push MILD peels into a scar but you should target the scar only and not the surrounding skin. 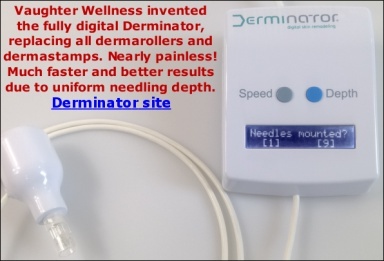 The single needle would be a better choice to use on the scar than a dermaroller. In case of stubborn scars or stretch marks, I recommend needling A-Ret into it. It will sting and it will get red. Redness can last for days but always subsides. We have done a dermaroller review and that roller (which goes under different names) was so bad that we threw it away and never even tested it fully. That "MNS roller" is easily recognizable for its cheap, chunky, squarish design (where the handle becomes the roller head). That roller can also be instantly recognized by the weak handle - it bends too much when pressure is applied, making it impossible, especially with longer needle lengths, to roll stably. Its needles are not surgical steel. The roller is of such bad, cheap quality that it is the only dermaroller of which I'd say "definitely don't buy it - so bad that it may be bad for the skin to use". Any company with that roller in their assortment is deliberately ripping you off, because we know how much that roller costs, wholesale, in bulk. I better not tell you, or you'll be very angry. Well.. It costs about 4 dollars. It's by far the cheapest dermaroller in the world, and we are not happy with the companies pretending that it's the bee's knees. This business attracts many "get-rich-quick-on-the-internet" types. Buy something for two bucks, sell it for fifty, all the while promising the moon, using every advertizing trick in the book. A flashy website is no guarantee for quality. The more marketing they do, the more money they have to spend on marketing, the less money left for the roller. Good rollers sell themselves. We do no marketing at all, zero. You won't find our ads in Google or anywhere else, except on our own site. We don't post commercial messages or links on forums. And we sell a dermaroller every 20 minutes, day and night, worldwide! We are growing steadily. Why? Our customers bring in new customers, and our customers stick with us long-term. Our business model is to have little operating costs and a small margin, so that we can sell very high quality at the sharpest margins, outcompeting all the greedier sellers, all the scammers and even all the companies that are larger and therefore need to hire marketing people, website people, bookkeeping and advertizing people. A good product sells itself and won't need thousands of sites all "pushing" it. Yes you can. But not after medium depth or deeper peels. You would have to let the skin heal first. The Subcision-suction method: A new successful combination therapy in treatment of atrophic acne scars and other depressed scars. "Frequent suctioning at the recurrence period of subcision increases subcision efficacy remarkably and causes significant and persistent improvement in short time, without considerable complication, in depressed scars of the face." Prior to suctionng, instead of subcision, needle the scar aggressively with the single needle from all angles or use a dermastamp. "start of suction on third day after subcision for flat and depressing subcised scars and its continuation at least every other day for 2weeks." Subcision is a much more aggressive method than needling/stamping so you should actually start suctioning sooner than 3 days after needling/stamping. Start a day after. The suctioning method is so new and this (cheap!) method is so rarely used by doctors that the absolutely optimal approach is not known yet and you have to basically improvise and try different approaches. Dermarolling / Microneedling / Want to start Dermarolling, but am unsure how to start. Scarring needs needles that reach the dermis part of the skin. You should use a 1 mm or 1.5 mm dermaroller. Dermarolling / Microneedling / What size needle should I use for smile line? Do you mean the lines in this photo? It needs longer needles than 0.5 mm You should either use the single needles (you will need a numbing cream I think) or use a NARROW 1.5 mm dermaroller. No, it is not possible to share the roller with anybody due to hygienic concerns. A 1.5 mm dermaroller sometimes causes pinpoint bleeding. It is like any other needle - needles should not be shared. Not even short-needled dermarollers can be shared. There are several studies concerning retinoic acid and hypertrophic scars and keloids. Unfortunately in many cases you have to pay for the study to view them. “In a clinical trial twenty-eight intractable cases with scars were treated with daily applications of a 0.05% solution of retinoic acid. Selected therapeutic applications of topical tretinoin. “Since topical retinoic acid was first used for acne in 1959, many additional uses have been described for lesions on the skin, oral mucosa, and ocular surface epithelia. The topical application of retinoic acid has been shown to be effective in the treatment of several disorders of keratinization, keloids and hypertrophic scars, and various infections and inflammatory, pigmentation, and malignant and premalignant disorders. This article briefly reviews the use of topical retinoic acid for selected cutaneous conditions”. Scar tissue contains the same collagen as scar-free skin but the collagen fibers are differently aligned. Vitamin A is essential for normal activity of skin cells. Vit. A increases neovascularization of the dermis which could improve the scar since scars tissue is typically badly vascularized. Vit. A also increases skin cells mitosis and thus acceleration skin´ s renewal which might contribute to the improvement of a scar tissue. The effect of vit. A is actually not yet fully understood but in a way it “normalizes” skin. Needle the scar (once a month) and apply A-Ret immediately after. Continue applying A-Ret. Combine it with the pressure massage. Apply pressure with your fingers onto the scar for approx. 20 seconds, spot by spot. Repeat daily. If the scar is recent, you should first let it completely heal. Remodeling/maturation of a scar takes a long time. The scar will likely improve by itself. If it heals indentedly, use the single needles to needle it. It is a much more targeted treatment. The area on and around the lips is extremely sensitive so you will need a numbing cream to be able to handle the needling. Needle it once a month until it improves. Use vit. C, no problem. Dermarolling / Microneedling / can I use the Hyaluronic acid serum 100% pure? Hyaluronic acid is a Glycosaminoglycan naturally found in human skin, joints, saliva and elsewhere in the body. It has a very short half-life and it is constantly replenished. Hyaluronic acid binds to water, forming a viscous "gel" acting mainly as cushioning and lubricant. Cross-linked (stabilized gel) hyaluronic acid (such as Restylane, Juviderm or Captique) is used as injectable filler to plump up wrinkles, folds, lips or scars. Its effect lasts up to one year. Topical administration is not effective because the molecule is too large to penetrate the skin. Using it as a topical moisturizer is controversial. It binds to water and should draw water from the air but in case of low air humidity, it will likely draw water out of your skin. That is why it should be applied to the deeper layers of the skin. Hyaluronic acid is localized in the dermis and in the middle epidermis, but not in the stratum corneum or stratum granulosum – the outermost skin layers. If you apply it after dermarolling, hyaluronic acid will be able to penetrate and get deeper. I would certainly not recommend applying 100% hyaluronic acid after dermarolling. You should start slowly. Dilute your hyaluronic acid with a cream to reduce the concentration. If your skin reacts positively, slowly build up the concentration each time. Do a test patch first. Preferably not on your face. Do not overdo it. Especially when you are young, your skin has enough HA. Application is useful in aging skin. Hyaluronic acid (Restylane) is normally present in the body and the fillers from hyaluronic acid would last mere hours or days. That is why the hyaluronic acid in the fillers is crosslinked, which makes it much longer lasting. Some plastic surgeons administer hyaluronic acid in about 2 mm deep micro-injections across the whole face or the back of the hands for skin rejuvenation. They usually use the cross-linked, stabilized HA. Stabilized HA is very expensive. Non-stabilized hyaluronic acid products are gone (metabolized) within days of the injection. It is certainly a good idea to try topical application in combination with needling. But only in case of fibrotic scars such as you have. It is not suitable for acne scars because it inhibits collagen production and fibroblast proliferation. "An orally active synthetic antifibrotic agent structurally similar to pyridine 2,4-dicarboxylate. Pirfenidone inhibits fibroblast, epidermal, platelet-derived, and transforming beta-1 growth factors, thereby slowing tumor cell proliferation. This agent also inhibits DNA synthesis and the production of mRNA for collagen types I and III, resulting in a reduction in radiation-induced fibrosis. I think the topical formulation of Pirfenidone is called Kitoscell. It claims to reduce the fibrous scars by inhibition of growth factor TGF-B1 production. Unfortunately, the medical trials of the product that worked on the same principle failed to reach the desirable effects. The product was called Juvista. Professor Mark Ferguson, CEO Renovo, said: "We are extremely surprised and disappointed by the failure of Juvista to meet the Phase III trial primary and secondary endpoints." Would you be willing to treat half of your scar with needling only and the other half with the Pirfenidone and needling and let us know the results? In any case, let us know your results. At the moment and as far as I am aware of, there are no credible products for the prevention or treatment of dermal scarring. Infadolan ointment doesn't have to be used at night. Regarding A-Ret gel and vit. C: It is better to use those at night because they are sun-sensitive compounds, esp. Retin A. They do not have to be applied daily. Applying A-Ret daily will dry out the skin too much. You should use the sunscreen during the day and in the evening after you clean your skin, apply vit.C. If you use Infadolan right after dermarolling or you apply it daily around your eyes or on the back of hands for example, apply a sunscreen first and then Infadolan. (If you forget to apply the sunscreen first then apply it on top of the Infadolan). We have heard of a similar occurrence before on this forum. It is not totally uncommon to get those bumps and unfortunately I can't say for sure what the cause could be. I think it may be a good idea to start using a sterilizing solution every time you use the roller. We say in our instructions that a 0.25 mm roller only needs to be sterilized every few rolling sessions, but perhaps that is a bit too liberal and I'll consider changing it. We based that recommendation on what the known experts in the field advised - short-needled rollers need to be sterilized every few rolling sessions - but I think we should better err on the side of caution. I am of course assuming that you thoroughly rinse your roller after you take it from the dishwashing liquid solution - otherwise it's highly likely an allergic reaction to the chemicals in it. Given the fact that you did not get the pimples on your first roll and did not change your skin product routine (vit. A could also be a cause), the most likely causes are an allergy to detergent remnants or bacterial contamination. One of my sources say that some female skin in some cases can release histamines causing red manifestations (streaks, bumps etc.) when injured and it last days in some cases. In that case, you should roll less until the problem has subsided. The skin should gradually get used to rolling. Roll less frequently when you start with dermarolling and you can gradually increase it up to every other day rolling (with a 0.25 mm). Initially, in some individuals, skin reactions to dermarolling are relatively common. If you want t speed up the disappearance of the red pimples, you could try TOPICAL Benadryl (cream). It is OTC. For example this one: "Regular Strength Benadryl Itch Stopping Cream (1%)" or "Benadryl Itch Stopping Cream, Extra Strength (2%)"
It contains Diphenhydramine which is an antihistamine used to relieve allergy symptoms. Do not apply it all over your forehead, try a test patch first.